Schultz fourth-grader Amelia Pflaum gives a presentation about Ohio’s state flag Monday afternoon during the Ohio History Fair. Students at Schultz toured the fair and had a list of the types of presentations they were supposed to find, like a scavenger hunt, to encourage them to hear as many presentations as possible. 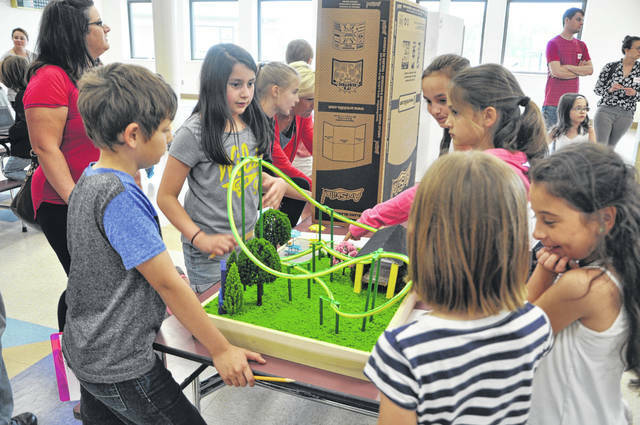 Schultz fourth-grader Taylor Flynn (left side in gray) gives her schoolmates a presentation about Cedar Point complete with a homemade roller coaster. What do Annie Oakley, cardinals, the 1974 Xenia tornado and Cedar Point all have in common? They are all part of Ohio history and were the subjects of presentations at Schultz Elementary School’s Ohio History Fair Monday. 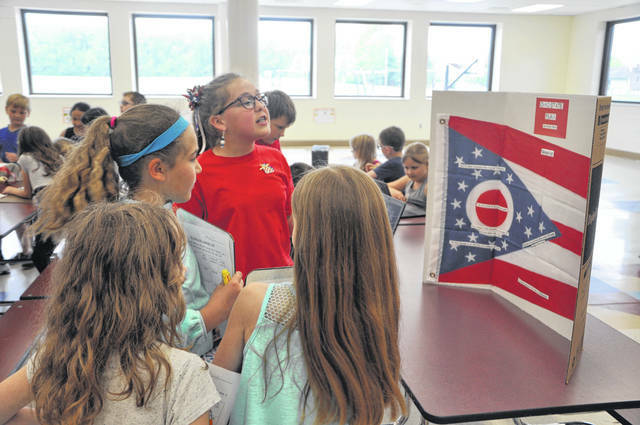 Fourth-grade teacher Jennifer Ault said fourth-graders at Schultz wrote essays about Ohio history or American history and then had to create a presentation about their topic to show to the rest of the school. Ault said giving students a chance to present their research is good for them. Ault said that to incentivize students to talk to as many presenters as possible, they had a sheet with different types of presentations to look for as if it was a scavenger hunt. Josiah Hill did his project on the Great Flood of 1913, which included a diorama he created showing high waters and homes in the flood. Hill said he picked the flood because it was “interesting,” and his favorite part was creating the diorama, which included roots and dirt dried under wood glue to act as a miniature of the land. Eleanor Bennett gave her presentation on singer/songwriter John Legend, who was born in Springfield, Ohio, and she said making her poster board, which included piano keys at the top of the board, was her favorite part. Hayden Cox said his favorite part of the project was actually writing an essay about the the 1974 Xenia tornado. “I picked it because it sounded cool,” Cox said. Cox added he used the school’s computers to do research on the project, and he learned both about the tornado and about how to do research from the project. Many students said they found pictures for their presentations online, but Kinzie Smith, who did a presentation and poster board on Warren G. Harding, said she took a little trip for her project. Smith said she picked Harding because he was from Marion, where her grandmother lives, and she took a trip to his memorial there to get pictures for her project. “That was my favorite part,” Smith said. Conrad Richards said learning was his favorite part of his project on cardinals, Ohio’s state bird.